In the light of recent events the questions about performing export of Wunderlist data raise. 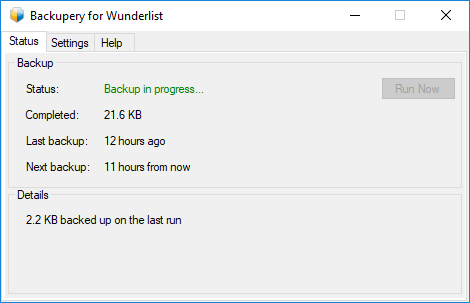 Probably Microsoft will create some way to transfer data from Wunderlist to To-Do in the future, but for now it won’t hurt to setup automatic backup of Wunderlist data to some safe place. Here enters Backupery for Wunderlist. It is the application to export all of your Wunderlist data to the destination of your choice. 1. Download and install Backupery for Wunderlist. Also, on Settings tab you can change backup period and review, add, change or remove backup destinations. 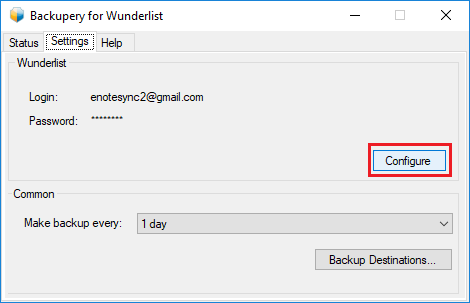 The application uses Wunderlist-standard export way (JSON file), so all the data can be easy imported back to Wunderlist if necessary. It would be great if the App supports Backuping Files as well! Thank you for your question. Currently the app doesn’t support backing up files. But I think that’s an awesome idea! Having it would definitely improve the application. We’re not working on that at the moment but we’ll definitely consider adding this feature into the next versions of the app. Hi, please look at the feature to support backing up files. For years I have been using Wunderlist not only as a to-do app but also as a note-taking app – having my notes, files and photos attached to the relevant lists. It would be really useful to be able to backup/transfer these. 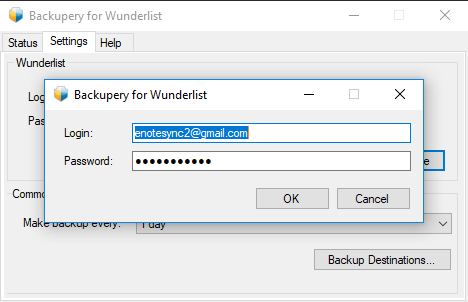 Now that Microsoft is about to kill Wunderlist, I am really in a panic mode and not sure how I will backup/transfer all the data. And I am not alone in this. Please help. Thank you for the vote. We continuously do review requested features and we hope to bring it in the future. The requested feature is not something we’re working right now, but we’ll consider adding it into the next versions of the app. Probably I should also mention that we provide consulting services for customizing our apps, building extra features and integrations. Please let me know if you are interested and we’ll build this feature just for you. If you have any questions, just let me know and I’ll be happy to help. Previous Previous post: Backupery for Wunderlist is here!